MANUFACTURER Citizen. Tested and working. No other accessories. Rapid IT's highly trained staff each have their designated area of expertise, so should you need advice or assistance you know you'll be getting the best possible help. Citizen CL-S521 Label Printer Software Bundle. The products and any claims about products on this site are not intended to diagnose, treat or prevent diseases or conditions. The information provided on this site is for informational purposes only. Citizen CL-S521 Label Thermal Printer. Condition is hardly Used & great condition. Manufacturer Part Number: 1000815. The CL-S521 direct thermal printer combines robust printing with superior price performance, ease of use and precision engineering. Manufacturer: Citizen Micro HumanTech. Citizen's PD24 is the next generation of stylish ruggedised portable printers. The PD24 features a full range of interfaces. All printers includeIrDA (infra-red),USB andRS232C serial interfaces as standard and theOption of Bluetooth ® wireless interface is factory installed on our most popular model (at extra cost). I will leve the print roll i was using in Printer. (Printer set for that lable). In good condition. GENUINE Citizen CLP 8301 300dpi printhead. This is not the printer for sale BUT the printhead ONLY. I have this item for sale as I no longer have the printer, which was for a venture that I never proceeded with. Citizen 1000815E CL-S521 DT. CL-S521 DT, Ethernet, Grey. Label Printer. Colour- Grey. Keep in touch. Change of mind. Model- CL-S521. Tablets & Phones. MAINLAND ONLY. Used thermal printer. Condition: Used. Body Jewellery. Quantity: 1x Piece. Works great. Have sign ofscratches due to handling and use. Why Choose Us ?. Global warming, sustainability, as well as living and being green are on the minds of people everywhere. Reducing the amount of paper used and wasteful power consumption is a big factor in reducing global warming. 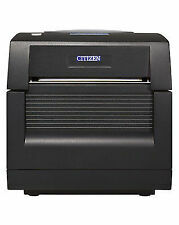 Available for sale is a Citizen CT-S300 Thermal Label EPOS Receipt Printer - 0282. Citizen's Hi-Lift™ design. Connectivity technology Wired. Maximum resolution 203. Print technology Direct thermal. Print speed 150 mm/sec. you can buy in set of 6 max. Form factor desktop. we do not take any responsibilty after this. Excellent condition. Works as new. All parts included in pics as a bundle. Also including a wibu key as shown in pic. Works via scsi cable (Not included cannot find it) not usb. Not used for about 3 years. Manufacturer: Citizen. Includes: Printer only. 24-10-2018 13:09:11. Model: CT-S601. International Orders. A used Citizen CLP9001 we replaced these with new printers. We are authorised Citizen Printer suppliers and all Citizen printers supplied by us are covered by the Citizen Warranty. Technology: Direct Thermal and/or Thermal Transfer . Options Including - Cutting and peeling: full auto cutter, Peeler. The OP900ii is a high-performance dye sublimation colourfast photo printer that prints up to 50% faster than competing machines and is easy to use with both Windows and Mac OS X. The OP900ii has been independently tested by colour consultants, who found that there are four key reasons why the OP900ii is the best printer on the market for both colour and B&W printing. CL-S700R, Thermal Transfer & Direct Thermal, 203 dpi, 254 mm/s, Parallel/Serial/USB. 300 dpi higher resolution available as a factory option using our CL‑S703 model or by upgrading a 200 dpi model. Maximum resolution 203 x 203 DPI. Use the BASIC Interpreter for specialist applications. I will leve printer i was usind in printer. (Printer is set up for current print roll.). In good condition. Backward compatibility with the older CLP521. The special Graphical Device Interface (GDI) enables printing out of any Windows application. The maximum print speed of 102 mm per second supports fast task processing. Its standard resolution of 203 dpi (8 dots/mm) ensures for sharp, very high-quality printouts. IrDA, Serial and USB interfaces with optional Bluetooth V.1.1. 50 mm/sec. printing speed. Citizen CT-S2000 Parallel Thermal POS Receipt Printer. Condition is Used. Dispatched with Royal Mail 2nd Class. Direct and thermal transfer printing. Print technology: Direct thermal / Thermal transfer. Maximum Mono Print Speed: 100 mm/s. Product Type: Direct Thermal/Thermal Transfer Printer. Form Factor: Desktop. Thermische Kassabon printer. Here you will find about 2000 more IT-products Price is including V.A.T. 2nd-Life-Printers = ALWAYS the cheapest on TM-H6000 Series ! Safety standard UL, C-UL, FCC class A, TUV-GS, CE marking. 1000815 Citizen CL-S521 DT, USB, RS232, Grey ZPL, 203dpi incl. - Automatically switch between Zebra ZPL and Datamax. - Citizen's Hi-Lift™ design. - For the ultimate in reliability and hassle-free operation. We are authorised Citizen Printer suppliers and all Citizen printers supplied by us are covered by the Citizen Warranty. Cutting and peeling: Tear bar, full cutter, Peeler. Technology: Direct Thermal. Ethernet LAN: N. Optional connectivity: Ethernet,Parallel,Wireless LAN. Maximum resolution: 300 x 300 DPI. Standard printer languages: ZPL. Print speed: 150 mm/sec. Print technology: Direct thermal / Thermal transfer. : 118 mm, print width (max.). : 104 mm, speed (max.). : 100 mm/s, dual interface (RS232, USB), emulation: ZPL, Datamax, colour: black. With thermal transfer ribbons of up to 360 m in length, print about 6,800 labels without ink ribbon changes, reducing interruptions to a minimum. Marke Citizen. Produktlinie Citizen CL-S621. : 100 mm / s, multi interface (RS232, USB, Wi-Fi), emulation: ZPL, Datamax, color: black. Direct thermal thermal transfer label printer. Desktop label printer CL-S621 black. CITIZEN PD24 Printer PD-24 Mobile Thermal Label Printer USB CABLE ONLY. Condition is New. Dispatched with eBay delivery – Shutl 1 day. Citizen CL-E720DT, 8 dots/mm (203dpi), USB, Ethernet (1000852). Citizen CL-E720DT. Marke Citizen. 8 dots/mm (203 dpi), USB, Ethernet, black. : 203 mm / s, USB, Ethernet. Verbindung Ethernet (RJ-45). Integrated USB and network interface; WLAN optional. White label printer direct thermal citizen CL-S521, 8 dots/mm (203 dpi), ZPL, Datamax, dual-IF,(1000816). Label printer citizen CL-S521 - 1000816. MPN 1000816. Produktlinie Citizen CL-S521. Marke Citizen. Citizen CL-S300, 8 dots/mm (203dpi), USB, dark gray (1000837). 8 dots/mm (203 dpi), USB, dark gray. Technology resolution print speed (maximum) width (max.). Roll size (max.). Marke Citizen. 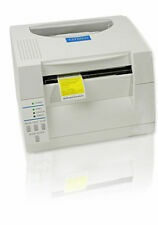 Desktop label printer CL-S300. Desktop label printer citizen CL-S400DT. Marke Citizen. Verbindung Cutter. Verbindung Ethernet (RJ-45). Verbindung USB. You will find in our. Verbindung Serial (RS-232). Matching consumables. 8 dots/mm (203 dpi), ZPL, Datamax, dual-IF, black. : 100 mm / s, dual-interface (RS232, USB), emulation: ZPL, Datamax, color: black. Marke Citizen. Desktop label printer CL-S621. Verbindung Serial (RS-232). Label printer direct thermal citizen CL-S521, 8 dots/mm (203 dpi), Datamax, multi-IF (Ethernet), white (1000816E). MPN 1000816E. ZPL, Datamax. Auflösung 203dpi. USB, RS232, Ethernet. 150 mm / sec. 12.5 mm - max 118,1 mm. Citizen CL-S700R, 8 dots/mm (203dpi), rewinder, VS, ZPLII, Datamax, multi-IF (1000794). MPN 1000794. Marke Citizen. : 254 mm / s, multi interface (RS232, USB, parallel), ZPLII, Datamax, rewinder, moveable sensor, Manufacturer's warranty: 24 months. Citizen CL-S521 Label Thermal Printer. Printer is used,test self done-see picture.Prints are correct. Printer is used,test self done-see picture.Prints are correct. Condition is hardly Used & great condition.